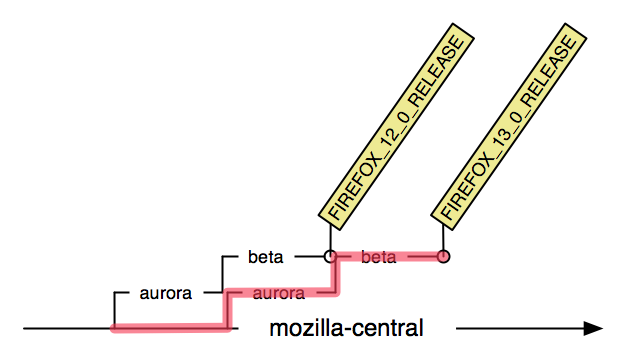 I was recently asked to provide a list of all the plugin-related changes from Firefox 11 to 12 to 13. This is actually not the easiest question to answer: both bugzilla and source code searches may produce false negatives and false positives. Using bugzilla to answer this kind of query fails whenever the bugzilla metadata is incorrect or misleading. Usually the Target Milestone for a fixed bug indicates the release version that it first ships in, but it is not uncommon to forget to set the TM for bugs. And when a bug is backported to an earlier train, the target milestone doesn’t always get moved backwards to match. In addition, filtering by bugzilla component often leaves out important bugs, since changes to graphics, DOM, layout, or JS can make noticeable changes in plugin code. By default, hg log -rfoo:bar will list the changes between two particular revisions in whatever linear order these revisions happened to be pulled into your repository. This means that you may get different results depending on the order you pulled. But there is a feature in Mercurial called “revsets” that lets you pick changes in much more specific ways. For more information about revsets, issue hg help revsets or see the online documentation. Special thanks to Dirkjan Ochtman (djc) for introducing me to revsets! This entry was posted on 9 Jul, 2012 at 11:38 am and is tagged with , djc, hg, mercurial, revsets. Trackback. Thanks for writing this. I’ve been doing this by using date ranges which is very error prone. I wonder how well that works with the train process where something could have landed in 12 when it’s on aurora or beta, and on 13 through m-c.
glandium, that is a possible false-positive, yes. But I’m willing to tolerate a few false positives of that sort because you can easily figure out from the bug what’s going on. MJG, I really don’t know, I can only barely use git. Since hg is how Mozilla keeps trees, it seems worth documenting how Mozilla devs would normally do it!